I have been wanting to find a way to introduce J to the months of the year, so I have been brainstorming ideas lately. I also have a stack of paper plates that I wanted to use. That's how I came up with this month spinner. To make the spinner, I cut the trim off of one paper plate. I then wrote the names of the 12 months on the circle using permanent markers. Next, I cut an opening on the other plate that was big enough for the month names on the smaller plate to show, but only one at a time. Then I attached the plates with a brad fastener. You could also have your child decorate the top paper plate. I held the month spinner up in front of the light box so that you could get an idea of how the spinner was made. 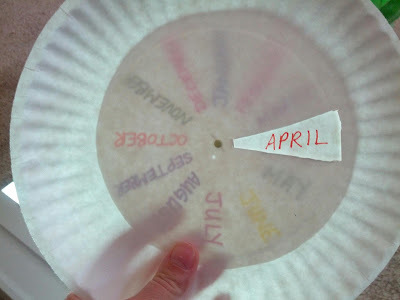 I have lots of activities planned for this spinner, but for now, J was happy to spin through the months with me, reciting the names of the months. Great idea, can't wait to see what you guys do with your spinner! I have a few ideas planned so we'll see how they turn out.